Stamp Palm Scene on a 3″x4″ piece of white card stock, using Memories black ink pad. Color with water based markers. Cut a piece of Embossable Tape to slightly larger than Palm Scene. Peel bottom layer and carefully place over Palm Scene. Trim excess. Peel top layer and add clear beads evenly over top. Press in place. Cut a piece of golden card stock 3″ x 3 3/4″. Cut top corners with Southwest Punch. Cut navy card 4 1/4″ x 5 1/4″. Cut bottom corners with Southwest Punch. Attach golden card to navy and both to copper card stock. 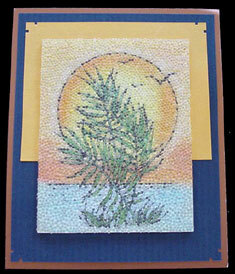 Attach Palm Scene with foam mini dots.